With over 800 national and regional acts performing on 11 stages spanning over 11 days at this year's "Big Gig," as the locals call it, Milwaukee's Summerfest once again proved why Guinness World Records has named it the world's largest music festival for the past 16 consecutive years. Held at Henry W. Maier Festival Park on the city's scenic Lake Michigan shoreline, the 47th annual bash hosted some of the world's biggest artists, including Bruno Mars, Outkast, Lady Gaga, Usher, Brad Paisley, OneRepublic, Dave Matthews Band, Luke Bryant, Nas and Ludacris to name just a few. With such a staggering number of artists and their engineers coming through the park for the 2014 festivities, Summerfest's longtime production provider, Clearwing Productions, chose to rely on DiGiCo consoles to run the FOH mix for six of the festival's seven largest park stages. This tally comprised SD5s at the helm of BMO Harris Pavilion and Harley-Davidson Roadhouse, SD10s at Miller Lite Oasis and Briggs & Stratton Big Backyard, and SD9s at ULINE Warehouse and U.S. Cellular Connection, plus an additional SD9 as a monitor console for U.S. Cellular. As a general rule, these desks drove stages traditionally equipped with L-ACOUSTICS K1, K2, KUDO and/or KARA systems. Furthermore, a majority of the touring acts that brought their own production into the 25,000-seat Marcus Amphitheatre also carried DiGiCo desks, including Bruno Mars, Lady Gaga and OneRepublic, among others. "Summerfest after Summerfest, DiGiCo's presence in the touring and festival world has grown, and this festival is definitely a place that this growth becomes apparent,” says Clearwing Audio Operations/Logistics Manager Bryan Baumgardner, who notes that this is the 20th season in a row that Clearwing has serviced the festival. “This year, just about half of the consoles we deployed were DiGiCo, with many days having multiple touring DiGiCo consoles visiting as well." Baumgardner adds that DiGiCo's SD Converter software, which allows session files to be transferred from one SD range console to any other, was mission-critical to the outcome of the festival. 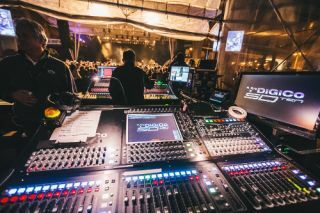 "As we had nearly the entire SD range on site, DiGiCo's SD Converter played a major role in making sure that touring engineers' files were compatible with the console deployed at each stage," he says. "SD Converter allowed our technicians to scale console files up or down as needed in a very quick and efficient manner. This tool perfectly complements what I consider the industry's best and most technologically advanced product line, making the SD Series the ideal festival console. I am very much looking forward to yet another successful year in 2015 with DiGiCo."